our perfectly imperfect life: Wordless ... Tuesday? ETA: You can view our full proof gallery here (username: customer, password: myproofs). These images are copyrighted. That means copying or printing these images is illegal. Don't say you weren't warned. Ha. Oh my goodness, such beautiful children, all 3 of them!!! WOW! I love it! The outfits are DARLING!!! 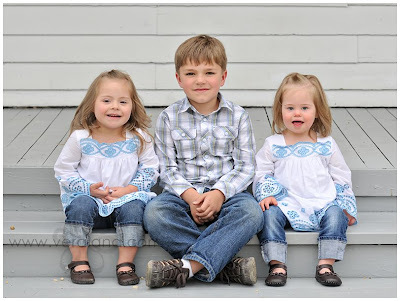 Those are 3 of the cutest kids I've ever seen! Gorgeous kids! Love the outfits (now, if only I could dress so well). your kids are amazing, and so are your photos. What a beautiful picture!!!! I hope to someday get a picture of my kids all looking at the camera and smiling! WOW. Those pictures are all awesome. I noticed Nika's eyebrows are so perfect....she just fits right in with your family so perfectly. So cute! I love their outfits! Your kids are gorgeous!!! Nika is growing up so fast - she looks like a total toddler, not a baby anymore. you have such a gorgeous family!!! OMGosh those are simply amazing!!! Wow, love the pictures!! Did you get these done through that Heroes organization? I've applied and requested a photographer but haven't heard anything in quite a while. Just wondering what your experience was if that's how these were done? Love them all, of course!!! Oh my- I did about tear up on a few of them. Love the tulips. Love the family shots. You'll have to update PP with a new family shot now. And, your hair looks darker- did you have it darkened? No, we did it through the Celebrating Adoption Program. Not sure what the Heroes Program is? OK I just went in and looked at all of the pictures, they are all so great!! I love pics taken outside, they are always so much more crisp looking. You all are beautiful, and are photographed well!!! Those are beautiful pictures! Nika is growing up so fast...the pictures of her up close and the one by the tulips are my favorites. She is so blessed to have such a wonderful family..I shutter to think of her life if it weren't for you and your husband. You Girls are just so beautiful! And Mason is like the Cherry on top! What a handsome Devil! Bethany you are so blessed! Beautiful photos. I love the girls outfits. so cute. Very cute! Love the rolled up jeans and big brother is so sweet to sit elbow to elbow with his sisters. I can't remember the exact name of it, but it was mentioned on the DS listserv awhile back. The photographer donates the session fee to families who have kids with special needs. It's Littlest Heroes or something like that. The pictures are all great!!!! Such cute kids! a perfect picture. all 3 kids kiddos looking at the camera even. They are so cute.